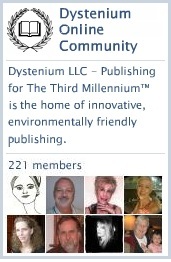 Join Robert Curtis and approximately 190 other new writer and author friends at the DYSTENIUM Online Community. Click on the above image to get started. Membership is 100% free of charge. Satisfaction guaranteed or your money back! This entry was posted in DYSTENIUM Online Community, ning, Photography. Bookmark the permalink.